"René's work and his growing business are the products of passion – a passion born of fire and the magic of the ancient art of glass blowing. He is enthusiastic about sharing his love of the art and his skill with the community." 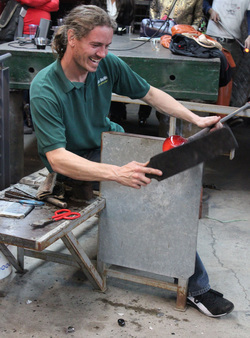 René Steinke started apprenticing as a glass blower at the age of 17. Under the demanding guidance of an accomplished artisan, he learned the discipline necessary to be comfortable in a medium that has little room for error. René also attended the prestigious Corning School of Glass in Corning, N.Y. There he studied under a number of master glass blowers such as William Gudenrath, and expanded his horizons. Later, he participated in a glass blowing workshop and annual competition at the Eugene School of Glass in Eugene, Oregon – a community known as a center for education and production of hot and soft glass. In 2007, he served as Artist in Residence for a Redding, CA, studio –teaching novice and intermediate artists as well as producing stunning new work. René expanded his work as a glass blowing instructor by teaching for Rainbow Glass in Sacramento where he hand-built a working studio that helped to popularize the art in Sacramento. He also did glass blowing demonstrations at the California State Fair, Fe Gallery and at Second Saturday celebrations throughout Sacramento. René further enhanced his glass blowing skills by participating in the 2011 GAS Conference in Seattle, where he quickly grasped new techniques to add to his growing repertoire. Later that year Renè accepted the position of Artist in Residence at the prestigious American Fine Art Editions in Scottsdale, AZ, where he created numerous large pieces that are featured for sale at the gallery. At the same time, René began to realize his lifelong dream – to own and operate his own studio. He worked for months to convert a Sacramento warehouse to a glass working resource, building his own equipment and innovating to make the very costly furnaces, kilns and tools using scrap metals and repurposed materials. In spring of 2012, he held his first glass blowing demonstration and art show. Glass blowing classes followed and the dream moved into reality.